I finally did it! I've been wanting to try out this project for a long time since I don't have a dressform and don't foresee forking out the dough to buy a new one any time soon. Many of you will recognize this project, it's been floating around the internet for quite some time. For those of you who are unfamiliar with the technique, the dressform is essentially a duct-tape paper-maiché copy of your body which you then stuff and mount on a stand. 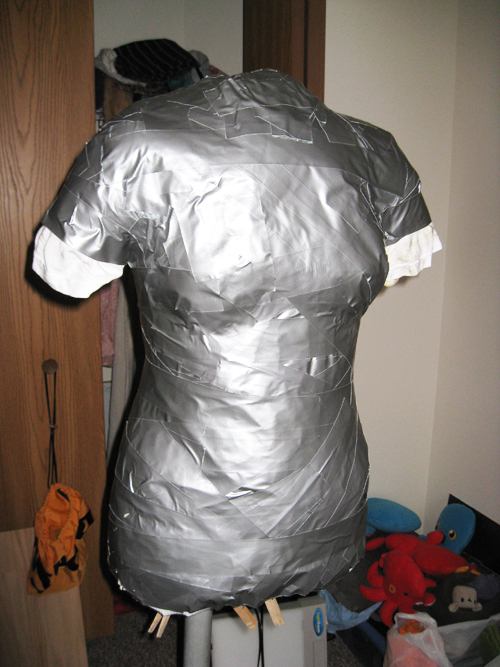 For this form I had 3 eager helpers (who knew that my family members would be so excited to wrap me in duct-tape?) and we used about 1.5 rolls of tape. Before getting taped, I put on a sacrificial t-shirt as well as a tube cut from an old shirt to lengthen the hip area. We also wrapped my neck in plastic wrap to protect my hairs and skin. 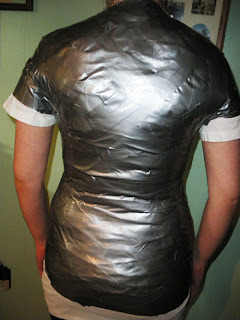 We then cut the duct-tape up the back and sealed the seam with more tape. My dad was kind enough to make me a pvc stand with a dowel cross-bar in the shoulder area. We stuck the stand in the bottom and filled the cavity with crushed newspaper and 2 cans of spray foam. Let it dry overnight, and Voilá! I still want to buy a natural color t-shirt to make a slip cover for my form so that I can pin to it and such. Not bad for $20! UPDATE: My family and I redid this project again since the spray foam hadn't set-up completely before I put it upright on the stand and the chest and shoulder area began to sink and distort. The new version is stuffed only with a tiny bit of foam and mostly newspaper. It seems to be holding up well. I'll let you know if there are any more developments! Note: These are the things that I learned along the way that I think you should know if you are attempting this project. Wrap up your neck farther than I did mine so that your dummy will have a neck. Be careful when covering the bust. 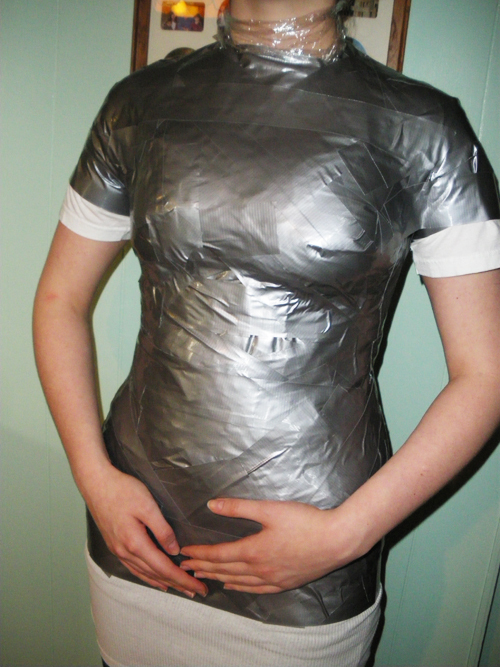 We wrapped my body very tight, which is good in the waist and hips, but it compressed my bust so now my dressform has a bust measurement 2 in. less than my true measurements. 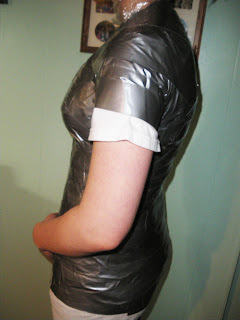 It might help to use smaller pieces of tape here and try to place them to preserve the body's structure. Seal the back seam very thoroughly. Mine popped open when the foam expanded giving my dummy a slight hump. Wear gloves when using spray foam and only use it outdoors with a drop cloth. IT DOES NOT COME OFF. Literally. We tried acetone, pumice, rubbing alcohol...My dad even tried using carburetor cleaner, nothing takes it off. Don't let it dry inside without putting down newspapers or a drop cloth because the foam can leak out as it expands and dries. I have this a similar tutorial saved in my bookmarks, and it's been on my list to do! I'm glad to get your advice on the project!